Be the first to hear about their new releases and deals. 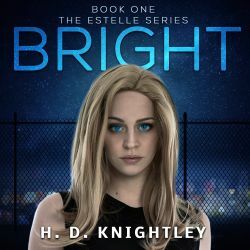 Download the Booksprout app and search for H. D. Knightley today! There are a lot of commonalities in my books—fairytale flavors, magical leanings, environmental issues, romance with quirks, surfing hotties, and wishful thinking. But I mostly like to write about heroes who are completely in over their head at least some of the time. These are people faced with huge environmental issues—light-polluted skies, droughts, piles of hoarded things, encroaching water—that rise above and carry on anyway. These are insurmountable difficulties, yet my protagonists choose hope and love instead of despair. My characters are not perfectly strong, more like creatively ordinary, yet capable of amazing things. They include Estelle (The Estelle Series) who becomes a celebrity dissident for starting a farm; the Princess Amelia (Fly: The Light Princess Retold) who discovers gravity and rescues her kingdom from a drought; Edmund who scales heights to rescue Violet (Violet’s Mountain); and Sid and Teddy (Sid and Teddy) who find each other through a fog of grief. I live and love and write in Los Angeles. We don’t have much water, it’s a lot like my book, Fly. Except Fly is a fairytale.